My name is Isaac Bertman, I’m in the Philosophy, Politics and Economics program at Denison and over the summer I had the privilege of working with Volunteers for Outdoor Colorado (VOC) as a marketing intern. VOC is a Denver-based nonprofit that is dedicated to motivating and enabling Colorado’s citizens to take care of their natural areas. Throughout the project season, which includes all summer and part of autumn, VOC organizes a variety of trail building and ecological restoration volunteer projects all across the state. As the population of Colorado is growing at a breakneck rate, this sort of volunteer stewardship is crucial to prevent the degradation of Colorado’s outdoor spaces. As a VOC intern, I had a variety of different tasks. I worked with the marketing and outreach departments to recruit volunteers for projects, both on the phone and via email. I also worked as a fundraiser by asking for donations from local businesses and organizations. One of my favorite parts of the job was when I was actually able to go out on projects and help build or maintain the trails we were working on. Early in the summer, I was trained in proper trail building techniques, so sometimes I was even given my own crew of volunteers to lead. The best part of this position, and what I think sets it apart from other internships, was that it included a capstone project. This project is chosen by the intern early in the summer and steadily worked on through the ten-week period. The purpose of the capstone is not only to provide the intern with a project that they can have almost complete creative independence over, it is also meant to leave VOC with something useful at the end of the summer. My capstone project involved research on various types of nonprofit coalitions, as VOC is preparing to become an active member of a nonprofit stewardship coalition. At the end of the internship, I gave a presentation and handed in my research paper, which VOC will likely use to help guide their strategy going forward. This was my first time working for a nonprofit organization and I enjoyed it for a few reasons. Firstly the staff was very committed to the objectives of the organization, which made the office environment very fun and friendly. Every veteran of VOC, especially my direct supervisor Jamie Burke, was very helpful and would patiently answer my many intern questions. Also, the nonprofit environment meant that the lines between job titles were a little blurred, and oftentimes people would help each other where they were needed. This was especially fun when three or four staff members made it out of the office to work on one of the projects together. I’d like to thank my supervisor Jamie Burke who was enormously helpful in getting me set up and oriented at the office. Ann Baker Easley, Executive Director, and Dean Winstanley, Director of Statewide Stewardship were my two main contacts for my capstone project and I could not have made any progress on it without their help. In fact, I would like to thank and acknowledge everyone in the VOC office, as they all assisted me at some point or another. Without them, this summer would not have been the excellent learning experience that it was. The beginning of my summer was full of fun and excitement. I had just gotten back from being abroad in London and had secured an internship working for a London start-up in New York City. I spent the weeks leading up to my time in New York City hanging out with family and friends anxiously waiting to start work and move to New York City. This was all threatened when the day before I was to leave for New York, and 4 days before I was supposed to report to my internship I received an email out of the blue explaining my internship had been canceled. The internship I had secured months before and had signed an offer letter for. Shocked and faced with a now possible extremely unproductive summer I decided to go to New York anyway and try my luck at finding a last-minute position. Luckily I was found a new position on a tech startup website and was interviewed and hired within a week of getting to New York. This job at a company called Airtame was actually a better position for me anyway! I was given way more opportunities and able to work with a young extremely innovative company that has put me in great positions for my future Job search. Denison has taught me many things. Resilience is definitely one of those things and it really came in handy this summer when I thought the summer I had planned was in jeopardy. I strongly believe my diverse education prepared me very well for this summer and my internship. This opportunity has led to more opportunities as I am working for the same startup part time now! I am thankful for the Denison community in continuously supporting me! We have a great line-up of peer advisors ready to help you take on a number of career related issues! Learn a little bit more about these fantastic career ambassadors. Alex Frank is a senior majoring in Psychology and Cinema. Alex shared “I’m so excited to be a part of the Knowlton Center team this year! I am thrilled to be a part of a team of hardworking and like minded peer advisors in order to help spread the word about the awesome opportunities and guidance the Knowlton center provides — along with learning about all things resumes!” Fun fact about Alex…she had a provisional patent on a medical device she engineered when she was 16! You can make an appointment or drop in to meet with Alex on Tuesday from 11-1 p.m. in Burton Morgan 306 or from 7-9 p.m. in the library. Sophie Lovett is a senior majoring in Mathematics and Environmental Studies. Sophie shared, “I have found so much excitement and energy as I have searched for and obtained internships and jobs throughout my college career. I am really looking forward to instilling that same excitement in my peers that come visit the Knowlton Center!” Fun fact about Sophie…she has been a flower girl in 7 weddings! You can drop in to meet with Sophie Monday between 2:30 and 3:20, Wednesday between 2:30 and 3:30 or on Thursday between 2:30 and 4:30. Rachel Elfman is a senior majoring in Economics and French. Rachel shared, “I am excited to be a peer advisor because the Knowlton Center has been very helpful as I have explored career paths and looked for internships. I encourage all students to start early and take advantage of the many resources available, including resume and cover letter assistance, mock interviews, and general career exploration advice. I look forward to working with you in the Knowlton Center!” Fun fact about Rachel…she studied abroad in Aix-en-Provence, France last semester and in addition to speaking French, she is also learning Spanish! You can drop in to meet with Rachel Monday, Tuesday or Wednesday between 2:30 and 4:30. The Knowlton Center for Career Exploration team welcomes you to the 2017-2018 academic year! Regardless of how you spent the last few months, we hope you had a great experience. I just joined the Knowlton Center at Executive Director earlier this summer, although I joined the Denison family six years ago when my older son started here as a member of the Class of 2015. My professional background includes 14 years in education as a teacher and admissions professional, followed by 20 years at General Mills working in the human resources function. I am delighted to be back in higher education. I have learned through my early conversations with some of you that the career exploration process can feel overwhelming at times. That was my experience when I was in college as well, but I encourage you to own the process and come see us and ask for help! The Knowlton Center team has been preparing all summer for your arrival. We’ve made some changes to physical space and shortened our coaching appointments from 60 to 30 minutes so we can expand our program offerings. Additionally, while retaining our commitment to true career exploration, our career coaches will be offering a focus on specialized career paths. Finally, we are launching the concept of “labs” (sessions on topics ranging from a general introduction to the career exploration process to resume writing to networking and landing a great internships or job.) 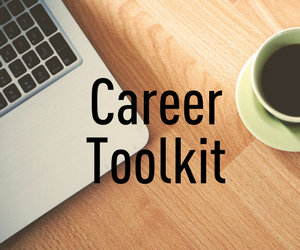 These changes were made to better help you more fully explore your future career and life! You’ll hear from us regularly throughout this year, including the weekly Knowlton Note. I hope you’ll take the time to read what we send you and to fully engage in your future! Have a great year and hope to see you at the Knowlton Center soon! Listen, we need to talk about commitment. I know, we’re all millennials—I mark “interested” on Facebook events so I’ll get a notification an hour before the event so I can decide then if I want to go—I get it. If something isn’t on my calendar, there’s a good chance that I’ll forget to do it (I’m working on that). But some things are different. How is David Allen ’16 surviving Medical School at The Ohio State University? Read on below! A large myth that continues to persist with people inside, and outside, of Medical School is that you study 100% of the time and forget about all free time for the next four years. I can safely say that no one does that. People can be intense, and hard working, and yet still have a life outside of medical school. In fact, I would go so far to say that you must have a life outside of medical school or it can be just a tad overwhelming (at least for me J). That doesn’t mean you have to sacrifice grades or anything of that sort, but it does mean that you need to figure out a constructive way to take time outside of your computer. So, with that being said, here are some tips! Working Out, video games, hanging out with friends, reading Scandinavian crime fiction (me), etc. Try something new, some of my friends like to sew or bake food. If you read this post and this emboldens you to bake food I expect a brownie once a week. This sounds cheesy and cliché (it is both!) however sometimes the material can be dry and it can be hard to see the big picture. Understand that all of this knowledge, even the smallest, tiniest detail could help you become the best doctor you can be. You never know when all of this could come into play. Another cheesy item! May as well call this post Cheddar! Becoming friends with your classmates makes every day a blessing, and makes you appreciate your life even more. I am so honored to go to a school where everyone is so much smarter than me as it is motivating and rewarding to know how much I can learn from every one of them. According to a report published in the Journal of General Internal Medicine in 2008; the wide majority of people change their specialty during the course of their medical school career, often it is even more than once [Compton et. al. 2008]. Thus, it is important to keep an open mind. Personally: I really like Pediatric Anesthesiology with a *subspecialty* in pain medicine, however, I am always welcome for some other specialty to blow my mind! You should try to study the material you have just learned as often as possible. For instance, let’s say I have four lectures one day, I want to go through these lectures and take notes as well as at least transiently go through the previous day’s notes. The volume of material can be overwhelming (it certainly is for me sometimes). The way to get through this is to consistently study previous big picture topics. Save the small stuff for later! Some helpful Apps: Anki (highly recommended, shout out to Krishna) and Quizlet (very good). Pathoma is an incredibly helpful and digestible resource to help with some of the tougher concepts. It comes with a book and an online subscription to very high-quality videos. It is expensive, but worth it. First Aid (any edition will do, and there are plenty of free copies online: beware of viruses!) is a very helpful big picture, high-yield outline of bigger topics that you might encounter throughout your curriculum. Since it is pretty barebones I usually save this for before exams, as it is a nice refresher. However, for Step One it may be a bit more practical. While I don’t use this app, it is a gorgeous and accessible form of annotative notes. Honestly, it may be the best overall app ever to take notes on. Very fun too. This is my personal preference and if you get adept at using this program you can effectively manage and organize your sections very well; however, this is a harder program to use completely than OneNote, and less appealing. Okay, so here’s the deal: YouTube CAN be a helpful resource for topics relating to Medical School, however, each curriculum is going to have their own nuances and addendums when teaching and the YouTube videos will not reflect those nuances. Thus, use caution when looking at YouTube videos. Khan Academy is probably the best. For Anatomy: Acland, NetAnatomy, Grey’s Anatomy, Complete Anatomy, Grant’s Dissector. These are all pretty standard for any anatomy class however I add them here just in case. All very good resources for the most part. You should be granted online access to all through your university library. For the most part, at the end of your First Two Years at Medical School, you will have to take a big, fun, 8-hour exam called STEP ONE! Do them, they are fun! You will hear literally 100s of different resources to study with. Keep it simple and only use the ones you can manage effectively. When in doubt, stick to the class notes J. As mentioned before, everyone is very different in regards to how they best study. So it’s important to see what works best for you. Likely, what worked in undergrad may not work in Medical School. If you go online and look up comments about Medical School, you may not see the most flattering items or comments. This track of life can be hard and blinding, and sometimes frustrating, but know that if you pass, you will do just fine :). Remember, you made it into this school for a reason; there is a group of highly trained physicians who think you are a special candidate. Some Websites to Avoid: studentdoctor.net, studentdoctor.net, studentdoctor.net. These people are not chill. Compton, M. T., Frank, E., Elon, L., & Carrera, J. (2008). Changes in US medical students’ specialty interests over the course of medical school.Journal of general internal medicine, 23(7), 1095-1100. This post originally appeared on UpByFive. Where do you want to be after graduation? We have a list of five reasons you should add our neighbor to the west to your short list! Columbus is a city of opportunities for individuals of many interests. The area is home to leaders in business, finance, nonprofit, startups, education, healthcare, even fashion. You name it, Columbus has it! Cardinal Health, Nationwide, L Brands, and Abercrombie are all headquartered here if you’re hoping to succeed in the business world. And you’d be in good company, all three employ Denisonians. Finance more your thing? How about JP Morgan Chase or Huntington? Both have multiple offices in the city. Columbus is home to leaders in healthcare including The Ohio State University Wexner Medical Center—a world-renown university and research hospital. Whether you want to research, work in a trauma center, a heart hospital, a women’s center, or more—Columbus has it all. Home to many nonprofits and startups created to solve the issues of our day, Columbus is a community that gives back and welcomes creativity. Your liberal arts education will prepare you well for any career in which you’ll need to collaborate across differences and creatively problem-solve (pro tip: that’s pretty much all of them). Looking for a job or internship? Check out the BioScience Career Fair, CareerFest, and the Blue Jackets Career Fair for opportunities in the area across industries. Pretty much everything in Columbus costs less than other cities—rent, groceries and entertainment. If you’re working or living outside the city center, you’ll definitely need a vehicle, but downtown dwellers have options including zip car rentals, bike rentals, COTA busses, and of course, Uber and Lyft. Columbus is home to the best in entertainment: major concerts, restaurants, and even professional sports! Columbus is for foodies, artists, sports fans, fitness enthusiasts, and everything in between. Whether you’re hitting up trendy restaurants or the gallery hop in the Short North, attending a concert at Nationwide or Express Live, drinking way too much coffee, logging a yoga class, enjoying the outdoors, checking out local breweries (when you’re 21, of course) and festivals like Pride, Comfest, and more—you can definitely keep yourself busy! Columbus is the home to the greatest number of Denison alumni in the world and it’s not just Ohioans that stay—alumni from all over decide to make Columbus home after graduation. Whether it’s a friendly face walking down the street, a business contact, or a lively crowd at a Denison alumni event—Columbus is the place to be. Finding a place that fits you is an important step in your career success. You’ll need to consider whether your industry presents opportunities, proximity to home, what you value, the weather you prefer, your mode of transportation, and what you like to do for fun. Don’t limit yourself based on preconceived notions of cities—get out there and start researching and exploring! Are you searching for a job and you’re unsure where you’d like to end up? Make an appointment to talk with a career coach about what you want from your new home and the job search process.